In our new condo we have a dining room table that looks even better than we could have possibly dreamed it would. This is it. We had a "concept" for a dining room table but realizing that concept took us on a journey of discovery of just how talented and sophisticated an artisan has to be to take a concept and to produce a piece of furniture that is functional and exquisite. Our interior designer suggested in October 2013 that our new condo which we were totalling furnishing should have a "signature piece." Audre embraced that idea and shared with Dimitri that we should have an inlaid wood dining table like our friends, the Dansons, have. 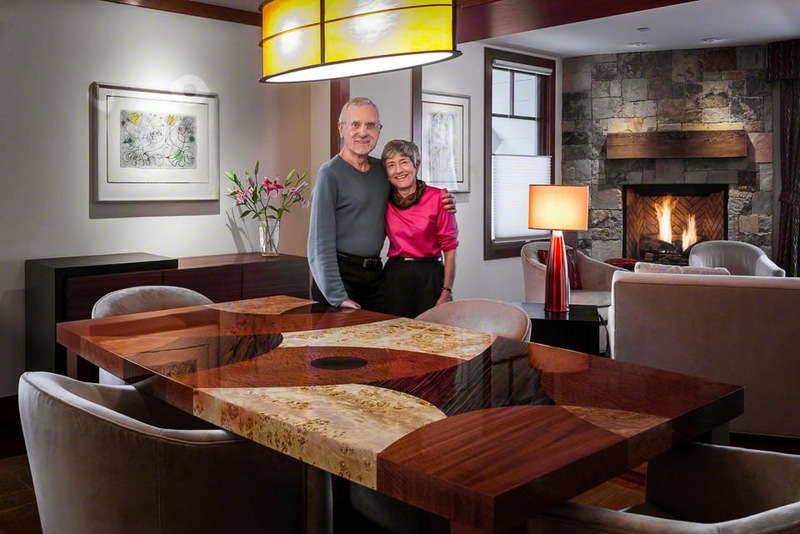 It is a beautiful piece of inlaid wood that they bought at Roche BoBois in Denver. Dimitri loved it too and we photographed their table and asked our designer to find us something like it. She could not and said she would have it made by a woodworker she recommended (at a shockingly high price). Early in November, Dimitri and Audre went to Denver to the Denver Design Center to try to find furniture for our new condo. The selections that our interior designer had shown us (which in the jargon is called "pulling") did not reflect our taste (which was/is remarkably similar) or our instructions. We had said: "We want it fully furnished and accessorized in a contemporary style, with clean lines and elegant pieces, not mountain rustic. We also want maximum functionality, maximum storage, and minimum customization." We were bummed out by our experience at the Denver Design Center. We couldn't find any furniture we liked there either. One late afternoon while we were in Denver, Audre did a Google search for marquetry tables and custom furniture makers. Audre put out a message to custom wood workers, attaching photographs of two inlaid wood tables that Dimitri and Audre liked. We got 12 responses from all over the USA. The eleventh response was from a furniture maker in Denver! We visited Jonathan Gerspach and his wood working shop in Denver while we were there. https://www.etsy.com/shop/GerspachHandcrafted?ref=l2-shopheader-name and Jonathan's Facebook page at: https://www.facebook.com/GerspachHandcraftedWoodworks where there are many pictures of our dining room table). Jonathan is an impressive 27 year old who sculpts wood into artistically designed furniture. He is also teaching future craftsmen/women at his alma mater. Within days, he sent us a 3-dimensional image, in color, of the table we had articulated that we wanted. It was exactly what we had asked for. Seeing it shocked us: while it was what we had asked for what we saw was not what we actually would like. Then we started getting cold feet. We didn't think we were artistic enough to design and specify what we wanted. In the meantime, our interior designer continued to be unable to find us a dining table that we liked and the ones she was showing us were 1/3rd to twice as expensive as the quote that Jonathan Gerspach had given us. Our designer suggested a furniture maker in Silverthorne, CO and said that he could make us a dining table that would reflect our conception. She said that she could "guarantee" her maker's work but not Jonathan's. In the meantime, Jonathan had furnished us more 3-dimensional images, in color, with the different woods that we wanted in a table that was sculpted into a subtle boat shape. It looked great but we felt we had to "go" with our designer's recommendation. Some things are meant to be. In November, the woodworker that our designer wanted to use told us that he could not complete the table when he had originally promised it and he did not offer a later date by which it would be done. We asked our designer to find out if Jonathan would still be available to make us our signature dining room table by the date in January we had previously specified. He said "yes". He continued to send us updates on the dining room table and photos as it progressed. It was an exciting process and he made it even more so by keeping us informed and feeling like we were part of its creation. The woods that Jonathan used are absolutely gorgeous. Late in November Jonathan said that he would like to meet us at our designer's office in Edwards. We didn't know why but, of course, were there to meet him. At that meeting, Jonathan unveiled a small "mock up" or model of the way the table would look with its different inlaid wood veneers. Jonathan ran the meeting with a casual yet professional style that was a pleasure to experience. He had a list of questions as to the details of the table that he asked. Not only were we impressed but our designer was too. She brought in her boss to the conference room and they both "oohed" and "awed". It is quite exciting to see the work of such a remarkable craftsman and even more so because we are experiencing his work at the beginning of his career. One of the recommendations that Jonathan made early on was to put a piece of glass on the table to protect it. Neither Dimitri nor I wanted that. While we were discussing how we would have to take care of the high gloss "piano" finish that we wanted, Dimitri wondered out loud whether Jonathan could make us place mats from the extra veneer that Jonathan would use. Jonathan said "yes" and we now have a set of 8 gorgeous place mats. When Jonathan delivered the table "on time and on budget" he also brought us 8 coasters as a gift. They are so functional and elegant! The next gift that Jonathan provided was a beautiful hard cover book chronicling the journey involved in the creation of the table. can find him at 1257 S Huron St., Denver, CO, tel. 845-220-8261, 845-742-4115 and Email: ghwllc@gmail.com. We have commissioned Jonathan to create 3 more pieces for our new condo and are posting details of each of his creations as they are delivered. Such beautiful and well deserved compliments on Jonathan's work. He is a true artist and gentleman.